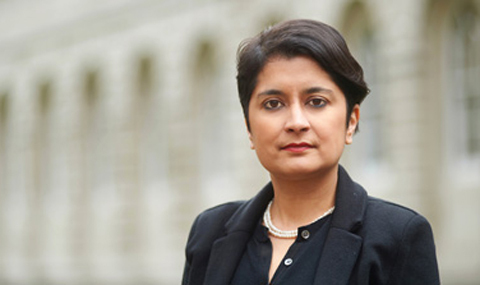 Shami Chakrabarti, former Director of Liberty, has been awarded an OII Internet and Society award in recognition of her efforts in defending digital rights in the UK, and helping to make these a mainstream political issue. While many of the political battles she fought during her time as Director of Liberty were over non-Internet related issues such as ID cards, terrorism and extradition and press regulation, she also made Liberty a champion of rights in the digital age, and has provided impressive and authoritative leadership on post-Snowden issues of privacy, surveillance and security. Shami Chakrabarti studied Law at the London School of Economics, and after being called to the Bar in 1994, worked as in-house counsel for the Home Office until her appointment as Director of Liberty in 2003. In 2011 she was announced as one of the panel members of the Leveson Inquiry, the judicial inquiry into phone hacking in the UK. She was appointed as Chancellor of the University of Essex in 2014, and has previously served as Chancellor of Oxford Brookes University. A frequent media contributor on the topic of human rights and civil liberties, she was described in The Times as “probably the most effective public affairs lobbyist of the past 20 years.” She was also shortlisted in the Channel 4 Political Awards 2006 for the “Most Inspiring Political Figure” award, and was one of eight Olympic Flag carriers at the London 2012 Summer Olympics opening ceremony. Earlier this year she was created a life peer as Baroness Chakrabarti of Kennington. The award was presented on 11 November 2016 in Oxford, at an awards dinner.